I got it totally finished last night. It has been dragged around waiting for me to finish the binding. In just over an hour I got the hand stitched binding done. Not sure it has a top or bottom. Both ways look great. The back with the bubble quilting. Someday I should do a large project all over it. I am using it as a little placement next to my chair on the oak side table. I have added this post to Crazy Mom Quilts Finish it up Friday, and Friday-Favs-Party 82, and TGIFF. I like the bubble quilting. I don't think I'd have the patience to do that, LOL. Great project. Looks great on your oak table. What a beauty! You've placed it in a great place to enjoy it too! 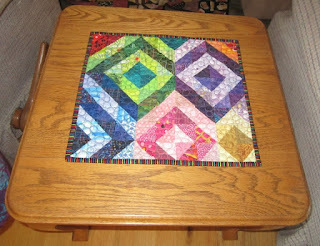 What a beautiful piece and how neat that you changed thread colors to match the different blocks!! Looks great! Love all of those colorful bubbles. 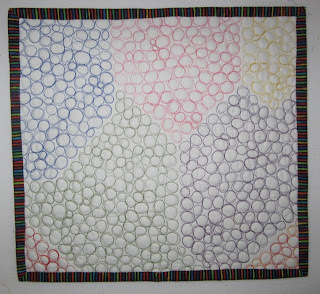 I really must try bubble quilting, I really like the effect. Nice! I like your bubble quilting too ... I really should try something other than stippling - is it tricky, Cathy? 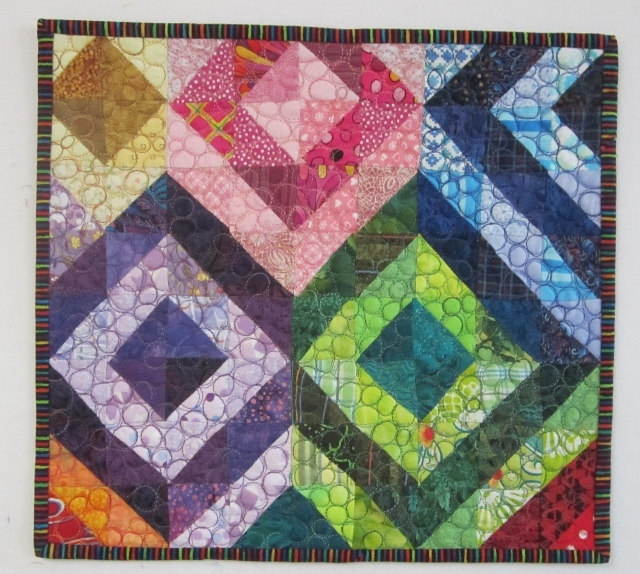 The bubble quilting in the various colors looks great. This is really cool. The bubbles are great! Nice job. 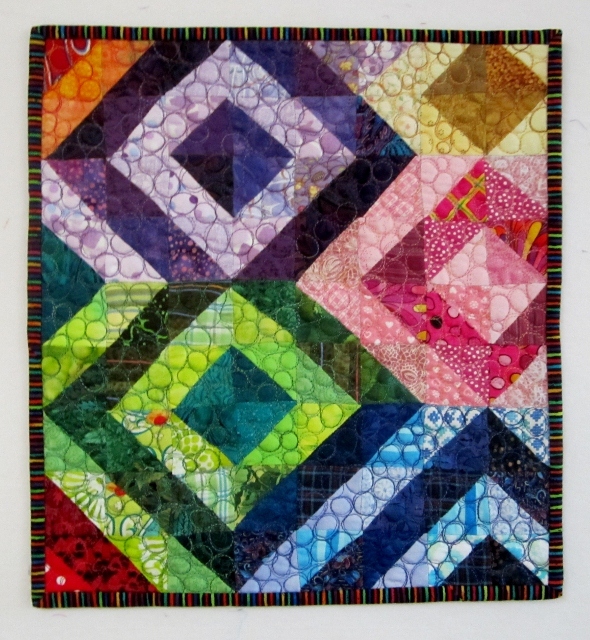 Such pretty colors, and beautiful job on the bubble quilting! Great mini quilt! 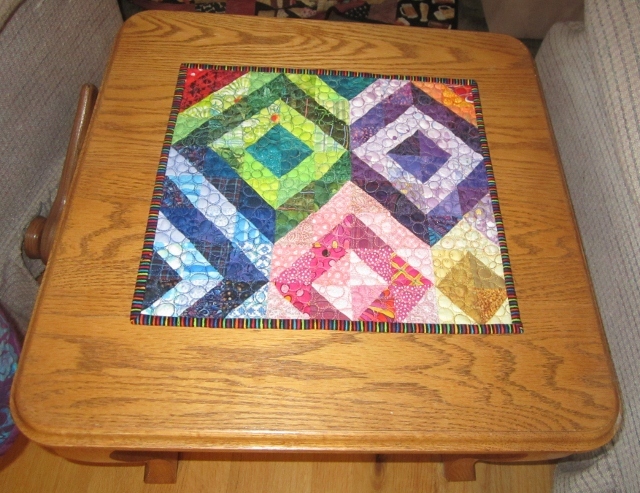 Your quilting is fantastic! Amazing...love the quilting and the striped binding! Great finish for Finish it Up Friday. Love the colours you used. And sitting on the side table... that will certainly be a welcome bright spot in the coming days of fall and winter. What a great piece. The quilting makes it even more fun. Oh yeah! Tiny bubbles, wonderful! I love the back. 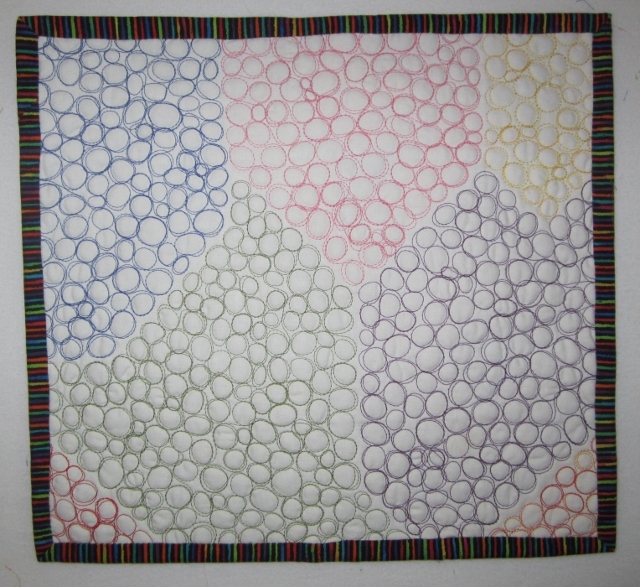 Gave me the idea to quilt 2 white pieces of fabric in a rainbow of bubbles. Wow! That's a lot of bubble quilting! How long did it take? 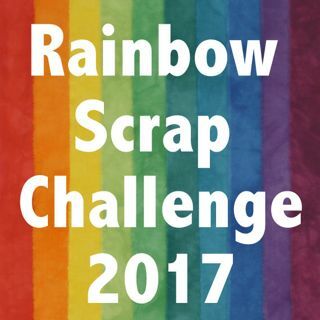 I am in awe of that rainbow bubble quilting! It looks fabulous! !